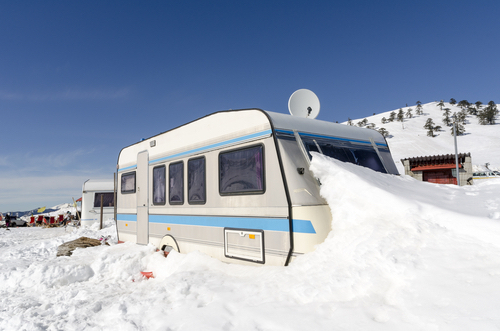 If you are planning to head out on a winter caravanning break this year, make sure that you dont get hit with a nasty surprise. Sadly, cold weather doesnt stop thieves, so it is as important as ever to make sure that your caravan or motorhome is safe while you are away. Caravans and motorhomes are often targeted by thieves. Its not just your caravan they are after either just think how many increasingly expensive valuables you take away on holiday with you. However, a lot of people mistakenly fall into the trap of thinking that thieves will only target caravans during the summer months. In fact, if you are staying on an unsecured caravan site or even one with minimal security, you could still be leaving your home from home vulnerable to thieves. Many caravan thieves are opportunistic. Therefore, if your caravan or motorhome is well secured, you will automatically have a better chance of keeping your belongings safe. With a safe caravan, you will get a greater peace of mind, which in turn will allow you to sit back, relax, and make the most of your holiday. Here at Phantom, we can help you to secure your caravan or motorhome as fully as you would secure your home. With our extensive range of alarms, tracking systems, and in-car camera systems, you wont have to worry about a thing. We can offer you a wide range of top-quality caravan and motorhome alarms. All of our alarms are designed to provide the utmost level of security and are professionally tested to the highest level. This means that you wont have to worry about the safety of your caravan while you are away this winter, as it will already have been taken care of! If you want an even greater peace of mind, we can also offer you one of our tracking system packages. Our bespoke tracking systems are tailored specifically to your needs, providing you with the flexibility to track your caravans location as well as the security of your vehicle. Dont forget your dash cam. Our range of in-car camera systems will fully record every step of your journey, which, combined with our alarms and tracking system, will provide you with comprehensive security for your caravan or motorhome while you are away this winter. To find out more information about how we can secure your holiday home, please get in touch or call us today on 0161 476 4050.